Medieval and later dispersed farmsteads on lower-lying hills, in landscape of medium-sized hedged fields and hollow-ways, with remnant strips of ancient semi-natural woodland on steeper slopes. Little ancient settlement evidence has so far been found within the historic landscape character area. 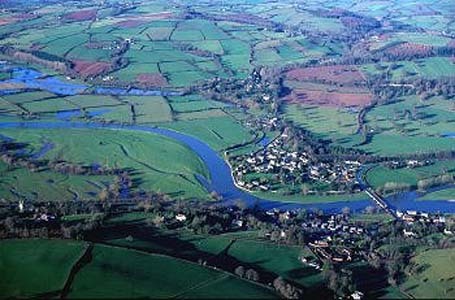 In the earlier medieval period the western part of the area fell within the kingdom of Elfael and the eastern part in the cantref of Glasbury in the kingdom of Brycheiniog, both of which came under the control of the Anglo-Norman marcher lords during the later 11th to early 13th centuries. At the time of the Act of Union in 1536 the area fell within the hundred of Painscastle in Radnorshire. By the middle of the 19th century it formed part of the tithe parishes of Glasbury and Boughrood. The area occupies predominantly south-facing, gently undulating low hills to the north of the Wye, between a height of between 100-210m above Ordnance Datum, and broken by occasional steep-sided stream valleys. There are remnants of ancient semi-natural broad-leaved woodland on steep banks at Sgylas Wood and along steep-sided streams near Lower Skynlais and Cilgwyn, and in the valley north of Cwmbach, as well as several small modern conifer plantations. The soils are mostly well-drained fine reddish loams (Milford Series) overlying the sandstone bedrock. Modern land-use is largely pasture, with some fodder crops. A strip of Common Land north of Cwmbach links the lowlands with the upland grazing on Ffynnon Gynydd Common to the north. Settlement within the area is characterized by dispersed medium-sized farms up to about 1.5m apart on hilltops. Several of these have their origins in the medieval and later medieval period, such as Upper Skynlais farmhouse which originated as a medieval timber winged hall-house remodelled and given stone rubble walls in the 17th century. There are a number of late 19th- to earlier 20th-century smallholdings in the area, with brick farmhouses and small corrugated iron barns. The agricultural landscape is dominated by small to medium-sized irregularly-shaped fields, often with boundaries set out along or across the contour. Many of the field boundaries on steeper ground have low banks and lynchets, indicating the greater prevalence of ploughing in the past. Most of the field boundaries are accompanied by robust, low-cut and occasionally laid multi-species hedges including hazel, ash and elder. Many of the farms, houses and cottages in the area were associated with orchards in the 19th century, of which some traces survive. The possible remains of fishponds of uncertain date are represented by earthworks north of Cwmbach, near Fishpond Wood. The straighter road between Glasbury and Boughrood which forms the southern boundary of the area is a turnpike road of the later 18th and earlier 19th centuries. The twisting roads and green lanes on the hills are probably mostly of medieval origin, some forming distinct hollow-ways up to 2m deep, formed by erosion before the introduction of metalled road surfaces, some of which are revetted with drystone walling. Few traces of former industry are represented within the character area, though there are a number of small scattered stone quarries for building stone.